You can bet your dog will happily wolf down this protein-rich, nutritionally balanced bison-based dog food. And no wonder— it’s got fresh, deboned bison, healthy fats, whole grains and vegetables! 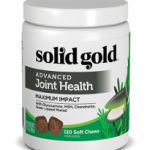 This dog food is designed to help rebuild and maintain your dog’s muscles and to support skin, coat and digestion. So go ahead, unleash your dog’s inner gold, if you dare! Natural, holistic dry food with added vitamin, minerals and amino acids for medium & large breed adult dogs. Delicious bison & ocean fish dog food with brown rice and sweet potatoes. Crafted with Bison, Brown Rice, Chick Peas, Sweet Potatoes and other wholesome and nutritious ingredients. Ingredients: Bison, Ocean Fish Meal, Brown Rice, Peas, Potatoes, Oatmeal, Chick Peas, Rice Bran, Dried Eggs, Sweet Potatoes, Tomato Pomace, Canola Oil (preserved with mixed Tocopherols, Natural Flavors, Flaxseed, DL-Methionine, Choline Chloride, Salmon Oil (preserved with mixed Tocopherols), Taurine, Dried Chicory Root, L-Carnitine, Carrots, Pumpkin, Apples, Cranberries, Blueberries, Broccoli, Parsley, Spearmint, Almond Oil (preserved with mixed Tocopherols), Sesame Oil (preserved with mixed Tocopherols), Yucca Schidigera Extract, Dried Kelp, Thyme, Lentils, Vitamin A Supplement, Vitamin D3 Supplement, Vitamin E Supplement, Zinc Sulfate, Niacin, Ferrous Sulfate, L-Ascorbyl-2-Polyphosphate (Source of Vitamin C), Calcium Pantothenate, Thiamine Mononitrate, Copper Sulfate, Riboflavin, Pyridoxine Hydrochloride, Manganese Sulfate, Zinc Proteinate, Folic Acid, Calcium Iodate, Manganese Proteinate, Copper Proteinate, Sodium Selenite, Biotin, Vitamin B12 Supplement, Rosemary Extract, Dried Lactobacillus Acidophilus Fermentation Product, Dried Enterococcus Faecium Fermentation Product, Dried Lactobacillus Casei Fermentation Product. Review: Our two Shar Pei both LOVED this food. The hearty size of the kibble ensured that they would not eat too fast. I liked that the protein sources were bison and ocean fish. The food contains a range of fruits and vegetables as well. Our 9 year old senior female with IBS ate this food, and had zero tummy issues. Our 5 year old male LOVED the food, and you could hear him chomping away at meal time. I would highly recommend this food for dogs of all ages. Review: My dog, a lab mix, jumped for joy every time I opened the bag! 2 Features: Healthy Ingredients, like that it uses Bison. 2 Benefits: Dogs are healthy and active, both dogs like it. Review: Its sometimes hard to feed two dogs that have opposites tastes and likes, but they both like this one! Usually my St Bernard mix will leave the dry food in the bowl. But not this one he licks it clean! 2 Benefits: My two large breeds LOVED it and seemed very full! They didn’t beg for treats as the day went on – that never happens! 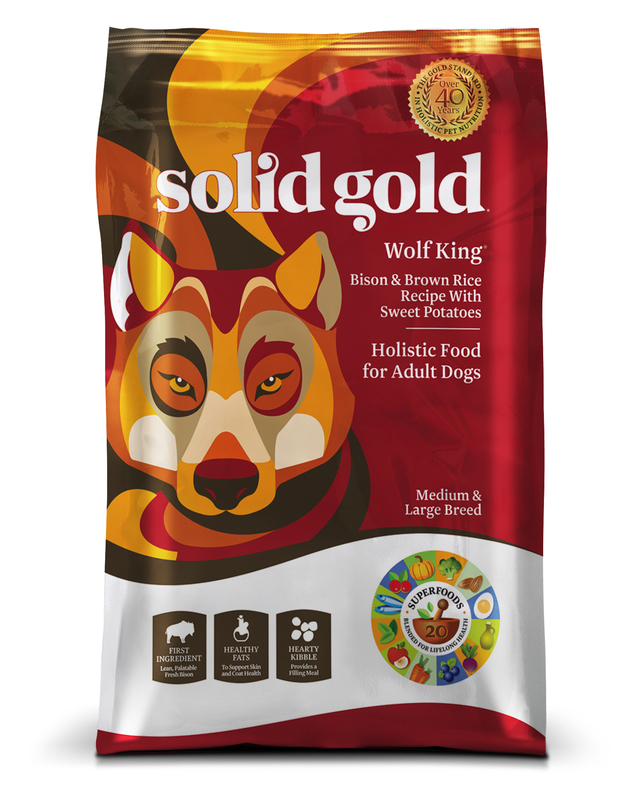 Review: I love all the Solid Gold products – this food was a great one for my larger dogs- they seemed fuller than with their other food. 2 Benefits: Dogs enjoyed the taste. Morsels the right size for large dogs. Con: Morsels appear dry, but my dogs ate them and didn’t drink extra water. Review: My large dogs heartily ate WolfKing with bison. The morsels were the perfect size for large dogs. Although my dogs sometimes are sensitive to beef, they did not have any digestive problems while eating this dog food. I definitely plan to feed this product again. Review: My husky loves this dog food every single day. Review: Our dogs really enjoyed this food. We liked that the larger kibble slowed down their eating, and helped clean their teeth. They really enjoyed this food, and I liked that it contains Bison, a unique protein, as well as Ocean Fish, for the Omega Fatty Acids, which help their skin and coat. We have a 4 year old dog, as well as a senior dog with digestive issues, and they both did well on this food. 2 Features: Healthy ingredients & no grains. 2 Benefits: The dogs loved the taste & the large kibble slows their eating down. Con: We have a third dog that we are fostering through Second Hand Hounds. He’s a Chihuahua/Dachshund mix and we thought the WolfKing kibble would have been too big for him. 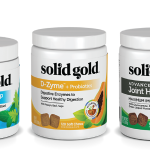 Review: Our dogs love Solid Gold food. It’s great that you offer these free samples of your food. It makes it easier for use to choose the right food for our dogs. This is our first time trying WolfKing and our dogs liked it. Our dogs are fast eaters. The large kibble of WolfKing slows them down. Review: The three dogs really enjoyed the Wolf King food. The kibble was larger than other brands so I needed to make sure not to give them more than their other food. They gobbled it up and licked their Kongs clean after every meal. Con: I have 3 English Mastiffs (and 1 Frenchie), so the food bill is a little high each month. But they still get their bison twice a day. Review: So many ’large breed’ dog foods have small kibble size. They would inhale it. Took a while to find this food. My male is sensitive to chicken. No problems with Wolf Pack. I’m stickin’ with it!